This might be the book you've been looking for. Because maybe you're overcome with compassion when strolling through thrift stores. Ugly chairs in antique malls cry out to you, "Help me, help me!" But you avert your eyes and hurry past. 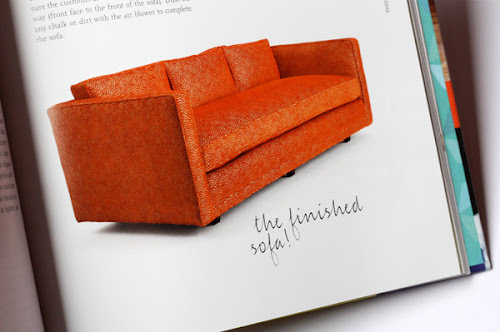 Sure, that chair has a gorgeous shape and could be a knockout in the right fabric. But you don't have a clue how to rehabilitate something so complicated. With a longing glance over your shoulder, you shove aside your feelings and move on. Maybe someone else will rescue it. Or maybe you could do it yourself with the help of Amanda Brown's new book: Spruce: A Step-by-Step Guide to Upholstery and Design. 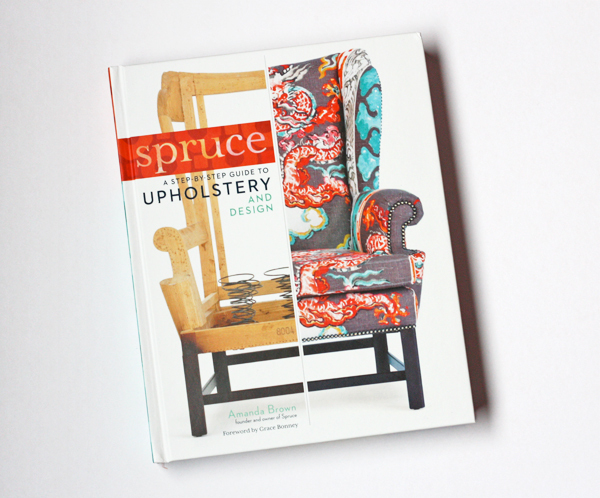 Amanda runs Spruce, an upholstery shop in Austin, Texas, and has written posts for the Upholstery Basics column on Design*Sponge. 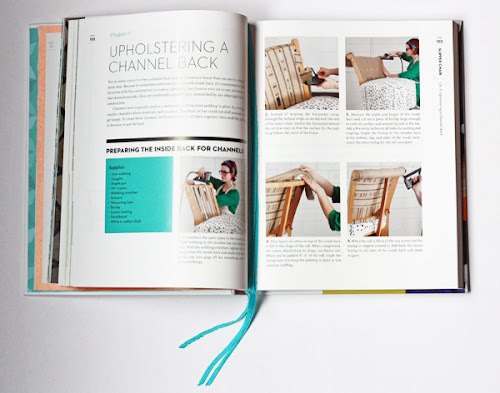 Her new book is a hefty 392 pages and teaches how to reupholster virtually any piece of furniture. 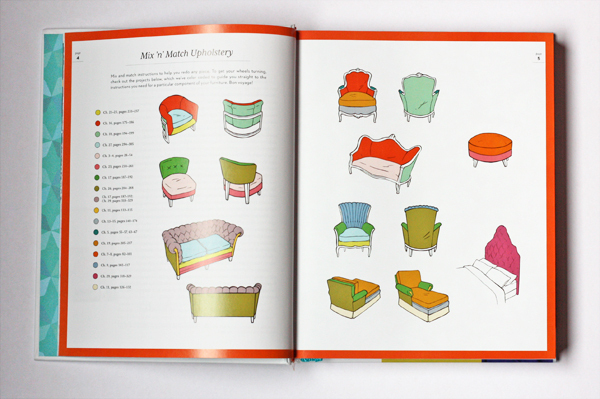 The book opens with a color-coded guide so you can focus on the area of your furniture you need to work on. Let's say your chair has a channel back. If, like me, you've never heard that term in your life, no sweat. Look for it in the picture and turn to the corresponding page. 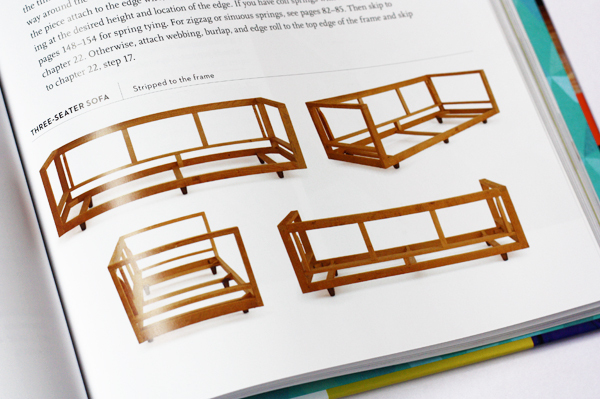 My favorite spreads show an array of completed projects. They get the gears turning and make me want to reupholster everything in my house. The manual shows how to replace the guts of furniture, not just how to change the fabric. 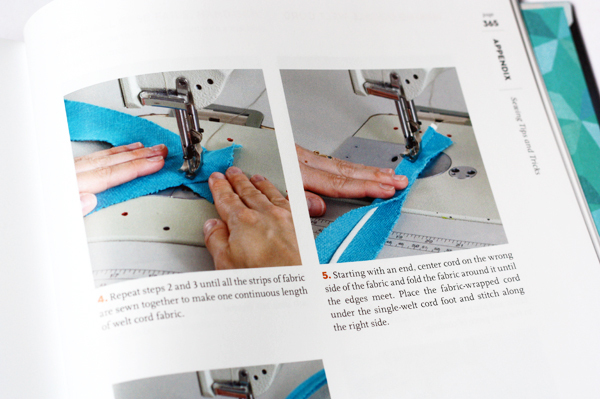 See how to replace springs, webbing, padding, and all sorts of innards and giblets. Learn how to sew welt cord and cushions. and arrive at a completed piece of furniture (extra points for orange). Watch the book's video trailer to learn more. If it sounds like it's up your alley, you can get a copy of the book here from Spruce or at other retailers. Share your ugly chair photo on Facebook right here and win upholstery supplies, design recommendations from Amanda, and a signed copy of the book. Even if you don't have a hideous chair to share, it's fun browsing the contenders. 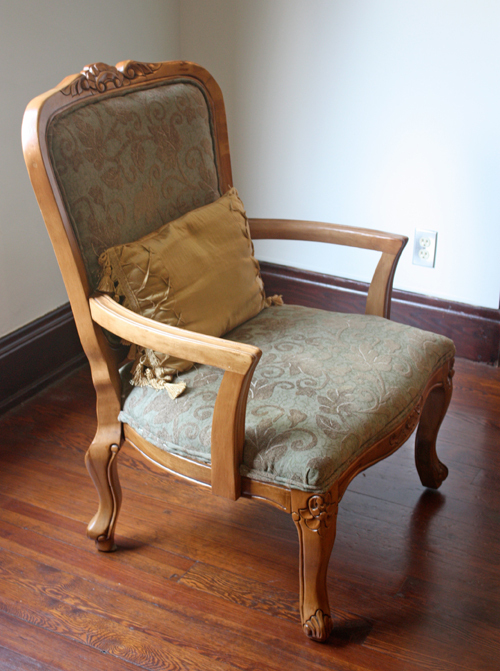 Tomorrow I'll share photos of my newly reupholstered Craigslist chairs. I did it, I did it! 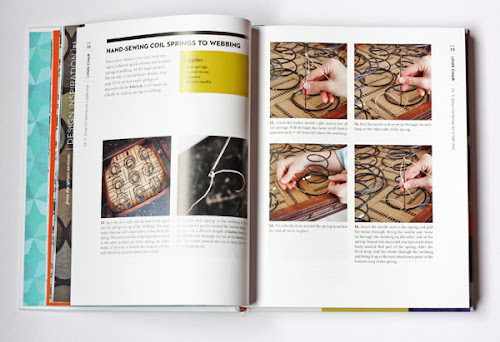 My husband would love a book like this for Christmas! I am going to look in to it further. Thank you for sharing! A great place to find craft supplies and other things for DIY projects is www.WorthysWholesale.com As long as you live outside their delivery area, (South Carolina) then they will sell to you without you having to present them with a Tax ID. Definitely worth looking at. Are you offering a way for readers to win a copy of the book, or is it just directly from other blogs and Storey's Facebook page? The latter--other blogs and the ugly chair contest on FB. I just stopped in at the only upholstery shop within 80 miles of me and they are backed up for months. I'm not that patient so this book is looking promising! Thanks for this! I think it might be the answer to fixing our 1950's red vinyl couch and chair springs - hooray! Settle down. I'm fetching the pictures off my camera right now. I just discovered you've been too busy gazing at your gorgeous trees! WOW!! I'd forget about blog posts, too, if I had those! How much could it cost to just bring it to a shop? What like $50? How little is your time worth? Hi Tom and Jimmy. For reference, two different shops quoted me $275 plus the cost of fabric to reupholster this fairly simple chair (plus a 5-6 week wait time). And that might be well worth it for some people. But if you're like me and enjoy tinkering with projects, it might be fun to attempt it yourself. Which I did, and love the results. There's no right or wrong answer, just what suits each person. Sign me up for this giveaway! I have a chair that could use some love! My boyfriend, my garage, my dogs and I would all benefit from this book. I have so many "projects" that could actually get done with a little knowledge. Thanks for the giveaway! Wow! What a pretty book. Looks like a great resource. 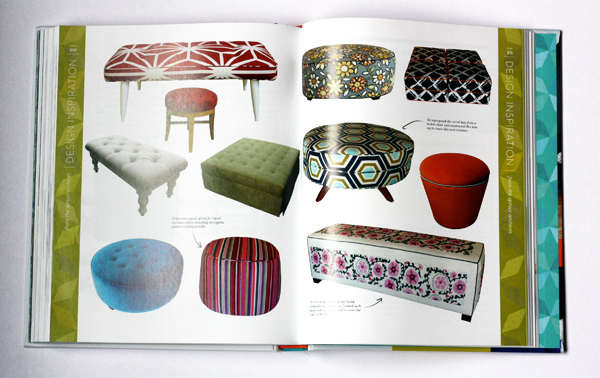 When I reupholstered our couches I literally went to the library, checked out the 10 books they had on upholstery and read them all! It all worked but I find that 1 book with all the right information is so much better! Your chairs turned out beautifully. I love the double welt.